A shining tree stands surrounded by the winter snow outside the Landratsamt in Freising, Bavaria in Germany heralding the coming of the Christmas Season, making a beautiful and peaceful evening scene. 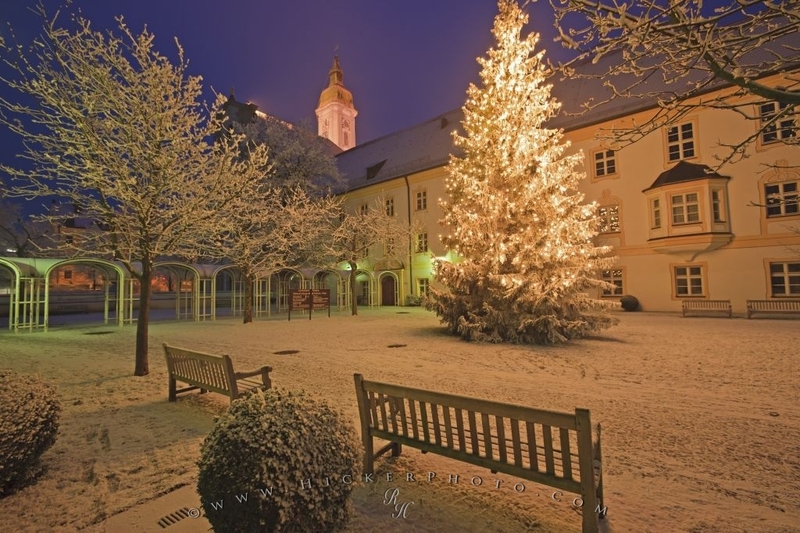 A shining Christmas tree stands in a dusting of snow, outside the Landratsamt, the regional administration building, in Freising, Bavaria in Germany. The Landratsamt building, in Neustift, was once a former monastery, so it is an appropriate spot for a tree to herald the joy of the Christmas season. The glow from the lights on the Christmas tree and the landscape blanketed with snow, highlights the area, making this a tranquil Christmas scene. The frosted trees remain motionless as the cold air sweeps past the Landratsamt. Hundreds of footprints have traveled across the snowy area, causing the dusting of snow to give off a unique look.Christmas tree outside the Landratsamt in Neustift, Freising, Bavaria, Germany, Europe. Photo of a Christmas scene during the onset of winter outside the Landratsamt in Freising, Bavaria in Germany, Europe.